Loosely follow in daddy's footsteps this Halloween when you put on our kids Jedi Luke Skywalker costume. 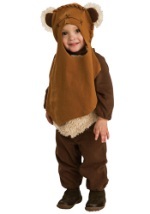 The child's Star Wars costume comprises of a 100% polyester ivory tunic. Matching elastic waist pants with attached boot tops and a brown foam belt are also included. Get into this kids Jedi Luke Skywalker costume to lead the Rebel Alliance to victory!